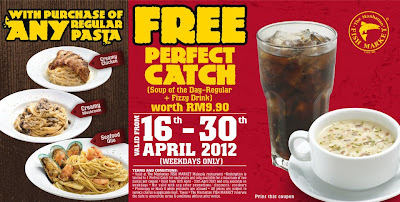 FREE "Perfect Catch" (Soup of the Day-Regular + Fizzy Drink, both worth RM9.90) with purchase of any "REGULAR" Pasta. [IMPORTANT] Print out the coupon below to enjoy promotion! Redemption is limited to 1 Perfect Catch for each pasta and only available for a maximum of two pastas per coupon. Photocopied or black and white coupons are allowed.